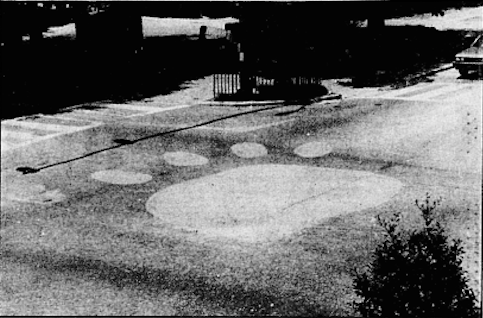 The first Toomer’s Corner tiger paw a few days after it was illegally painted in the late summer of 1989. The true history of Toomer’s Corner, as it pertains to Auburn tradition, is in large part a history of Auburn vandalism. No, it wasn’t some ancient form of communication. The toilet paper was a slow-developing ritual of rambunctiousness gradually granted immunity from legal tsk, tsk, tsks because hey, Auburn won, who cares? But the questions of legality (or at the very least propriety) of rolling the corner technically only completely disappeared 15 or so years ago. It sounds straight up insane today, but there was actually a brief local ban on rollings in the late 1980s—”litter” they called it—and despite the T-shirts and trademarks, certain elements of the university, the ones dealing with the practical, cleanup issues, were still wanting to do away with the tradition as late as 1997. And the tiger paw at Toomer’s Corner? The one you’ve driven over for as long as you can remember, that’s so inseparable from the corner’s modern aesthetic that it’s being permanently penciled into the pavement? It cost the guys who first painted it a night in jail. Or at least at the jail. That’s Frank Parsons–Butch to his friends back in the day–remembering his leading role in what both state and local authorities were briefly tempted to consider less a spontaneous expression of school spirit (as he’d hoped) and more an act of criminal mischief, or maybe destruction of property. There were several things they could have gone with, really. Parsons graduated from Auburn University in 1990 with a Bachelor’s degree, and with a Master’s in 1992. Today he’s the vice president for student life and dean of students at Huntingdon College in Montgomery. 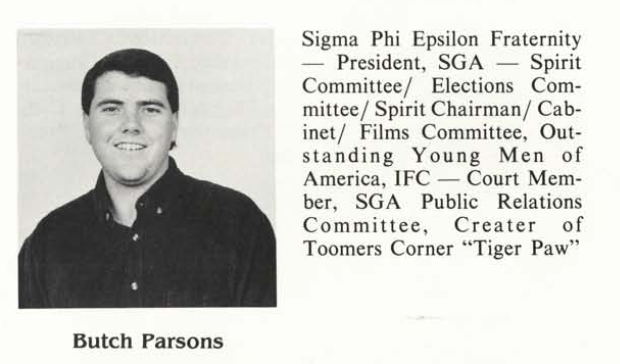 In 1989, Parsons was the chairman of the Auburn SGA’s spirit committee, which helped organize pep rallies, throw up decorations — just general spirit stuff like that, just like it sounds. When the Plainsman needed a quote about the 60,000 orange and blue shakers the SGA ordered for the 1989 Iron Bowl, they went to Butch. He was that guy that year. The Spirit Committee was responsible for painting the track of tiger paws that stretched from the I-85 exit ramp all the way to stadium. You remember them. “It was just a neat little way of telling the world that when you get off that exit you were in Tiger Country,” Parsons says. They did it every summer before fall quarter. They’d round up a crew in a couple of pickups and head out super late at night, or super early really (4 a.m.-ish) to avoid traffic. It was all strictly above board, of course. They’d get a fancy letter of permission from Montgomery every year. It was just a formality, but everything thing still had to be official, by the books. 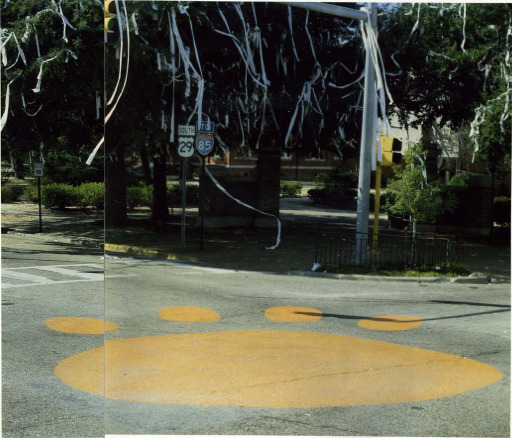 There was a certain kind of highway-grade paint they had to use, and a strictly specified route, a route that did not include Toomer’s Corner. But, you know… why shouldn’t it? Especially when we’re young and in college and it’s late and there’s all this leftover paint, five gallons at least! That’s what Parsons says he and the nine or so other bulletproof Spirit Committee boys in the back of the pickups were wondering as they wrapped up their work Sun, August 19, 1989 with dawn maybe an hour or so away. Nathan Levy, a committee man, can’t remember exactly who first suggested it. They scouted the area. Downtown was dead. The traffic lights were flashing yellow. There wasn’t a single car around. They hadn’t seen one in a while, not even a cop car. So absolutely zero traffic, and it was still pitch black outside. It was around five. The sun wouldn’t rise till around six. They parked in front of what was then Central Bank, the one with the clock. They hopped out of the trucks and went full speed. They swept off the intersection. They had stencils for the little paws, but, no, not a giant paw. So Kevin Boyett got the nod for a design. He was an architecture major. He knew how to draw. The rollers made it easy. 1990 Glom: Primitive but proud. That’s where the pizza boxes came in; they’d scarfed Dominoes earlier. They grabbed them from the back of Parsons’ truck and started fanning as fast as they could. No one wanted orange skid marks all over the place. It worked. It was dry. Everything was going like clockwork. They even had time, and the paint, for another coat. “In the moment, you’re thinking this must be meant to be,” Parsons says. And then…you know… in another moment, the cops drive by. At this point, the memories start to conflict a bit. Schreiber remembers the first brush with the law (ha!) not coming until toward the end–a couple of officers, just checking it out, impressed, smiling even, as everyone tried to look nonchalant. But a few minutes later, they were back. More of them. Lights flashing. No more smiles. That mostly matches Boyett’s recollection. Parsons, though, just remembers the fuzz coming once, right toward the end. Then they started asking questions. Parsons stepped up and tried to look in charge, tried to look like how a Spirit Committee Chairman just trying to do his job should look. Yes, officers, what seems to be the problem? Oh, just adding a little more school spirit here at Toomer’s Corner. Why wasn’t this cleared with us? Who gave you permission? Do you actually have permission? Um, well, hang on, let me see…you know, I think it’s probably sort of… hang on…. He went to the truck and rummaged around like he was looking for something that would straighten the whole thing up. He came back empty handed. No papers, no answers. Everyone remembers that part–Butch trying to fake it. Trying and failing. When the cop opened the cruiser’s back door… that’s when reality started setting in. This simple, War Eagle wild hair was getting tangled, complicated. But the deed was done. The paint was dry. The sun was coming up. Regardless of what happened, “we had made our mark,” Parsons says. Parsons, an Outstanding Young Man of America, and maybe a couple of the others rode with the police. The rest were told to follow them the couple of blocks to the station. They complied. It wasn’t an arrest, per se. “We didn’t just scoop them up and put them in jail,” Auburn Police Chief Ed Downing told the Plainsman once the news broke. But the words “formal charges” and “possible fines” were being tossed around a lot, too much. They started making as many calls as the cops would let them. Parsons called the president of his fraternity, Sigma Pi Epsilon. 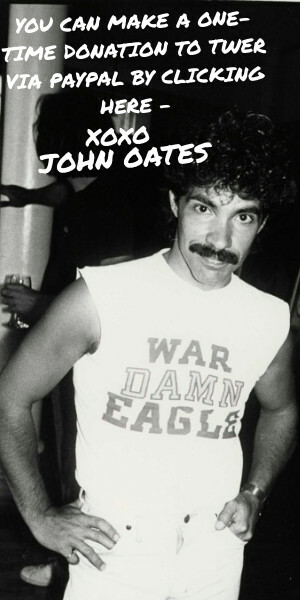 He called Grant Davis, Auburn’s assistant dean of student affairs. And he called a lawyer–his Bama grad dad. His dad put him in touch with local Auburn lawyer (and Kopper Kettle survivor) Andy Gentry. Conversations were had. Parsons and Co. were released. But the police made sure they knew it wasn’t over, not by a long shot. What do the City of Auburn and the State of Alabama have in common? They both, in their various legal dialects, stake a claim to the spirit committee’s canvas; that stretch of College Street is technically a state route. Which means they could both stake a claim to Parsons’ future. And Schreiber’s and Boyett’s and Levy’s and all the rest. Destruction of property, criminal mischief, multiple charges at multiple levels. Criminal records. Tainted resumes. Ruined lives! “We’re checking with the city engineers and the Highway Department to see if anyone wants to file charges,” Downing told the Plainsman. “There were three or four lines we had crossed because of the uniqueness of that intersection,” Parsons says. Of course, that the intersection was now even more unique was their best chance of beating the rap. That was, of course, the whole idea, and it’s the logic Grant Davis, the AU administrator who worked the most with the SGA, went with on his goodwill tour of city hall to smooth things over. Yes, he had been beside himself when he got the call, and he gave the committee a stern “MAKE GOOD DECISIONS!” talking to, “but at the end of the day he realized ‘hey, we may be on to something pretty unique here,” Parsons said. 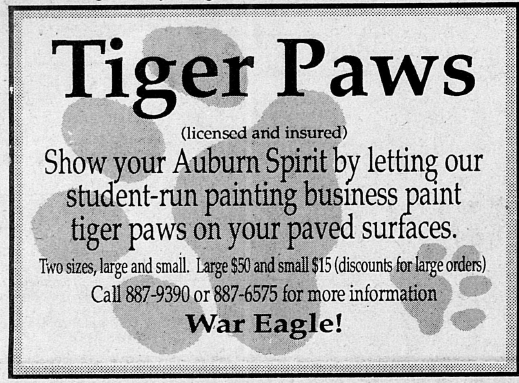 Some remember Auburn mayor Jan Dempsey kind of wanting to take a zero tolerance stance on the paw prank. Parsons doesn’t. At least she didn’t come across that way to him. Just the opposite, actually. Exactly–it’s Auburn. The city said keep it. The Highway Department said don’t worry about it. “The intersection is a downtown college area of slow-moving traffic and (the Highway Department) doesn’t see where it would create a problem,” the Plainsman quoted Parsons as saying a few months later, after the SGA repainted the paw–with permission, and even official traffic control assistance–for the very first time. For Parsons, it also turned out to be profitable. And it turned into an Auburn tradition. That’s how it happens. Twenty-six years later, the Auburn city engineers got involved. 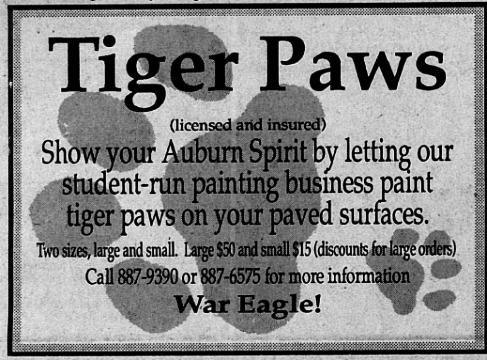 The tiger paw will no longer need to be repainted every year. The design will soon become permanent, formed by the color of the new brick pavers included in the renovated Toomer’s Corner intersection. What almost earned Parsons a criminal record instead earned him an amazing, enviable Auburn legacy. Great article. Information like this is why I keep coming back to TWER.